Are you enjoying the Swinging Sixties at the Nonnatus House during the eighth season of the Call the Midwife TV show on PBS? Although the Nielsen ratings typically play a big role in determining whether a TV show like Call the Midwife is cancelled or renewed for season nine, with public television TV series, other factors come into play. 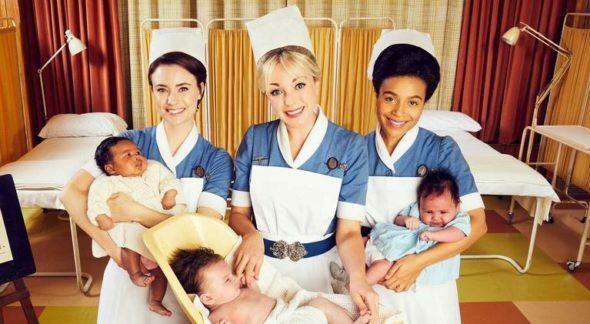 Because many viewers feel frustration when their viewing habits and opinions aren’t considered, we’d like to offer you the chance to rate all of the Call the Midwife season eight episodes here. A PBS historical drama based on the memoirs of Jennifer Worth, Call the Midwife stars Jenny Agutter, Linda Bassett, Judy Parfitt, Helen George, Laura Main, Victoria Yeates, Jennifer Kirby, Leonie Elliott, Stephen McGann, Cliff Parisi, Annabelle Apsion, Max Macmillan, Trevor Cooper and Daniel Laurie. The post-WWII series centers on the midwives and nuns at Nonnatus House, in the Poplar district of London’s East End. The eighth season kicks off in 1964, and everyone is anticipating the latest Royal Birth.